Mother’s Day is approaching. This month, how about changing things up a bit, and giving her special day a “legacy twist?” More below. Add life stories to your Mother’s Day checklist. A meal at her favorite restaurant? Check. A story session? Che- What? 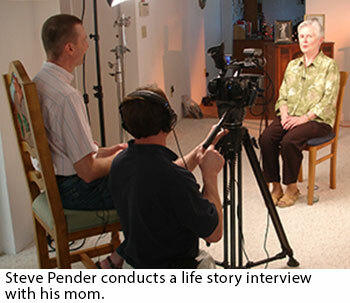 A few years ago, I interviewed my mom on video. I used the interview to create a video biography I gave to my brothers and their families as Christmas gifts. Boy, am I glad I did. You may not be able to arrange a full-blown video session with your mom in time for Mother’s Day, but you can certainly find the time for a brief question and answer session. If you have siblings, reach out to them and ask each of them to prepare a question for Mom about something they’d really like to know – about her, your dad, her parents, their childhood – the sky’s the limit. If they won’t be able to join you on Mother’s Day, ask them to text or e-mail their questions to you. If you and your brothers/sisters have kids, include them! I’m sure there’s stuff about Grandma they’d love to know. If you don’t have a camera or lights, don’t worry. There’s no need for a big production. Use a good-quality MP3 audio recorder. Place it close to Mom, or, better yet, buy an inexpensive lapel mic, clip it to Mom’s jacket, and connect it to the recorder. Start recording and let the questions begin. When you’re done, share the audio file with the rest of your family – and be sure to archive it! Not only will you have a lot of fun, you’ll also have an audio legacy your family will treasure. And maybe the experience will inspire you to capture more of her life stories later on. And don’t forget Dad – give him his turn on Father’s Day! It’s hard to believe that the Family Legacy Video® Producer’s e-Newsletter began in July, 2004. That first issue, and many editions thereafter, came via e-mail. The newsletter migrated over to the Family Legacy Video® website in 2013. That’s one newsletter nearly every month for almost thirteen years. Not a bad record! However, I’m not sure there’s much left to write about – so I thought I’d ask for your opinions. Do you find value in the newsletter? Would you like to see it continue? What kind of content interests you? Please send your thoughts and ideas to me at steve@familylegacyvideo.com.